EH-TW9400 4K Enhancement Pro UHD Projector, the model up from the TW7400, is HDR capable with 4K WiHD transmitter, motorised optics and 3LCD technology, letting you enjoy cinematic adventures at home. Earn 2549 loyalty points when you order this item. Epson EH-TW9400 4K Enhancement Pro UHD Wireless projector features 4K WiHD transmitter, 5,000 hour lamp life (Eco mode), Full HD with UHD BD and HDR support as well as Frame interpolation and Detail Enhancement for smooth, fast-moving action. 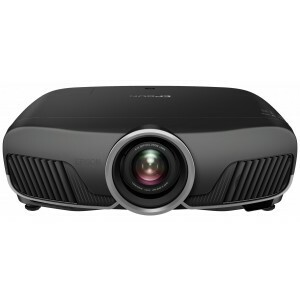 Enjoy the big screen experience at home with access to the latest 4K content with this affordable home cinema projector featuring sharp images, and an incredibly high contrast ratio, all with great connectivity and easy set up. Make your home centre stage for all the action with Epson’s home projectors. Transform the everyday, whether you’re catching your favourite sports, watching a classic movie, streaming a box set or playing the latest game. You can capture everyone’s attention with an impressive 300” display and bring family and friends together to experience those memorable moments. Epson 4K PRO-UHD is not just a resolution specification but rather encompasses all of the factors impacting image performance, including colour and white brightness, contrast, HDR10, colour processing, as well as the capability of receiving, processing and projecting 4K content. High dynamic range presents the optimal visual experience by increasing the contrast ratio to deliver a far greater range between the darkest and lightest areas of the screen. It gives images more depth and allows you to see incredible detail that’s previously not been possible. But that’s not all; it enriches colours which makes images feel more natural yet intense, and ultimately, more immersive. With HDR support, you can now take advantage of the latest HDR content available. White brightness alone cannot bring the true colours you see every day to life. That’s why the 3LCD technology found in Epson’s projectors delivers an equally high White and Colour Light Output (CLO). Why settle for a dull, washed out and lifeless screen? Experience vivid and lifelike images with Epson’s projectors. Avoid the rainbow effect with Epson's projectors that use three individual LCD chips to simultaneously project red, green, and blue light. In contrast, projectors with 1-chip DLP technology use a rotating wheel to project colours sequentially. Instead of a crisp edge, some viewers can experience the rainbow effect - a distracting and unnatural colour fringe. The ultra-wide colour gamut increases the range of lifelike colour, while the high contrast ratio delivers deep blacks for defined detail in the shadows. Even in the fastest action scenes frame interpolation and Detail Enhancement ensure motion pictures are sharp and smooth. Reducing motion blur in fast-moving scenes, frame interpolation technology inserts new frames between the original ones. As a result, blurring is suppressed and moving images look much smoother and sharper. Looking for flexibility when it comes to installation? Ours is quick and simple thanks to a premium optical zoom ratio, and lens shift capabilities: up to ±96.3 percent on the vertical axis and up to ±47.1 percent on the horizontal axis. What’s more, the motorised zoom, focus and lens shift can store up to 10 different positions, letting you easily switch between different aspect ratios at the touch of a button. The high-quality optical zoom also makes it possible to use shorter cables, keeping any possible signal degradation to a minimum. 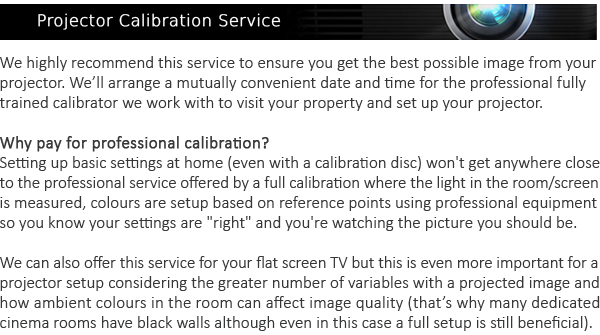 In addition, this projector can be calibrated to professional ISF standards for greater control.